Saboonchi, A., Mansouri, N. (2006). Simulation of Temperature Distribution in Hot Strip over Transfer Table. 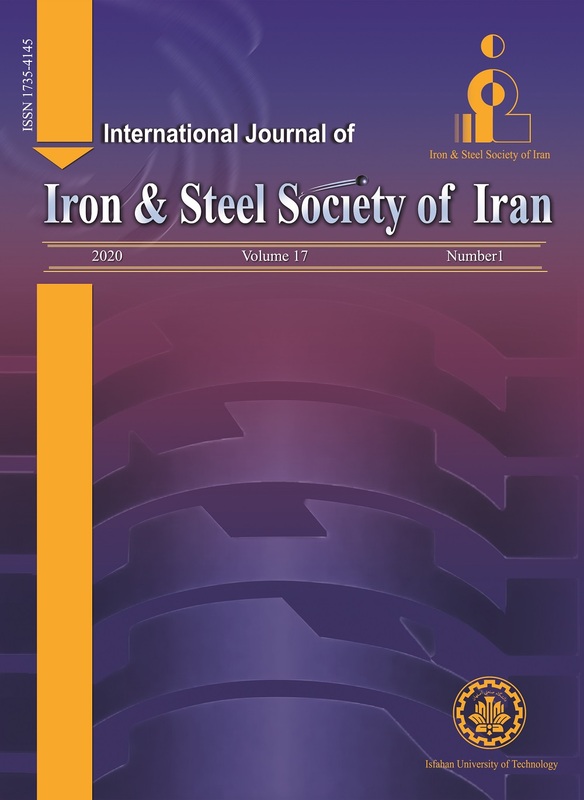 International Journal of Iron & Steel Society of Iran, 3(1), 26-32. A. Saboonchi; N. Mansouri. "Simulation of Temperature Distribution in Hot Strip over Transfer Table". International Journal of Iron & Steel Society of Iran, 3, 1, 2006, 26-32. Saboonchi, A., Mansouri, N. (2006). 'Simulation of Temperature Distribution in Hot Strip over Transfer Table', International Journal of Iron & Steel Society of Iran, 3(1), pp. 26-32. Saboonchi, A., Mansouri, N. Simulation of Temperature Distribution in Hot Strip over Transfer Table. International Journal of Iron & Steel Society of Iran, 2006; 3(1): 26-32. Transfer table is an essential stage between roughing and finishing rolling stands in a hot-strip rolling mill. High temperature and long time that strip is exposed to air at this stage cause a considerable heat loss that accounts for uneven temperature distribution, non-uniform surfaces, reduced product quality and increased production costs. Using thermal shields on the transfer table is considered an efficient means of reducing energy consumption and of improving product quality. In this paper, temperature distribution and heat loss from the strip is investigated while passing through transfer table in the hot-rolling at Mobarakeh Steel Complex (MSC),Isfahan,Iran. Three cases are considered; namely, in the absence of thermal shield, in the presence of thermal shield, and with both thermal shield and heat source. The results obtained from the numerical solution indicate that the case with both thermal shield and heat source on the transfer table has the most favorable effect on reducing heat losses and even temperature distribution in the strip. V. B. Ginzburg, Iron and SteelEng., (1985), 21. V. B. Ginzburg, W. F. Schniedburg, Iron and SteelEng., (1986), 29. S. Serajzadeh, A. Karimi Taheri, F. Mucciardi, Model. Simul. Mater. Sci.Eng., 10 (2002), 185. S. Serajzadeh, A. Karimi Taheri, F. Mucciardi, Int. J. Mech. Sci. 44 (2002), 2447. S. Serajzadeh, A. Karimi Taheri, Model. Simul. Mater. Sci.Eng.11 (2003), 179. S. Serajzadeh, App. Math. Model., article in press, (2003). H. B. H. Khadem, Msc. Thesis, Dept. of Mech.,IsfahanUniversityof Technology, (1998). F. P. Incropra, D. P. Dewit, 2nd Vol., 2nd Ed., (1990). N. Ramachandran, B. F. Armaly, T. S. Chen, ASME J. Heat Transfer,109 (1987), 1036. W. M. Kays, M. E. Crawford, Convective heat and mass transfer, Second Edition, McGraw-Hill, New York, (1980). T. Fuji, H. Imura, Int. J. of Heat and Mass Transfer, 15 (1972), 755. Y. Hayashi, A. Takimoto, K. Hori, 14thJapan heat transfer symp., (1977), 4.